We’ve been sleeping on linen sheets for about two months now, and let me tell you… we’ll definitely have a tough time going back to cotton. I’ve always liked that lived in, effortless look that linen provides. I also know that the fabric has a huge fanbase, and those who are enthusiasts realllly love it. Until I started sleeping on it, though, I didn’t really know a whole lot about the material and what it provides besides aesthetic appeal. So when I received these sheets from Flax Sleep, I decided to just try them out firsthand without being clouded by research and see how things went. You know that feeling when you jump into perfectly cool, crisp sheets on a warm spring night? Your body just eases in, you feel perfectly content, and all is right in the world. That’s precisely how I felt when I got into bed on the first night, except it was the middle of winter. I was shocked that my perpetually cold, clammy hands and feet actually felt… normal?! My body temperature regulated itself in the material, which remained cool to the touch while keeping me nice and toasty (but not too hot). The next day I did some googling on the fabric and saw that it was listed as one of the top benefits. It’s difficult to describe just how nice that sensation is, but to this day it has to be my favourite part about the sheets. Sadly, I was worried I wouldn’t be able to continue sleeping in them because Brian wasn’t a fan at first: he thought the sheets were too scratchy and didn’t understand the appeal. I convinced him to test try for a little longer, and fast forward to a week later he did a 180 and changed his mind! He now actually prefers the texture of the linen, saying it feels like someone is giving you a subtly exfoliating massage (kinda gross, but nice? ), and he also enjoys that they don’t feel grimy after a few too many days of not being washed (also a bit gross, but definitely a plus!). It’s hypoallergenic. Miles has eczema and sensitive skin, so I feel great about having him play in these sheets. As you can see from these photos, he loves them too! It’s breathable, helping air flow through the fabric easily to keep you cool and dry. It lasts longer: linen is definitely an investment, but it gets softer with each wash as opposed to cotton, which gets thinner over time. It’s also 2-3x stronger, making it resilient enough to last for generations. It’s all-season, keeping you warm in the winter and cool in the summer! It’s more sustainable: linen uses up to 20 times less water and energy to produce than cotton and nothing goes to waste. It also requires considerably fewer pesticides and fertilizers than other crops. 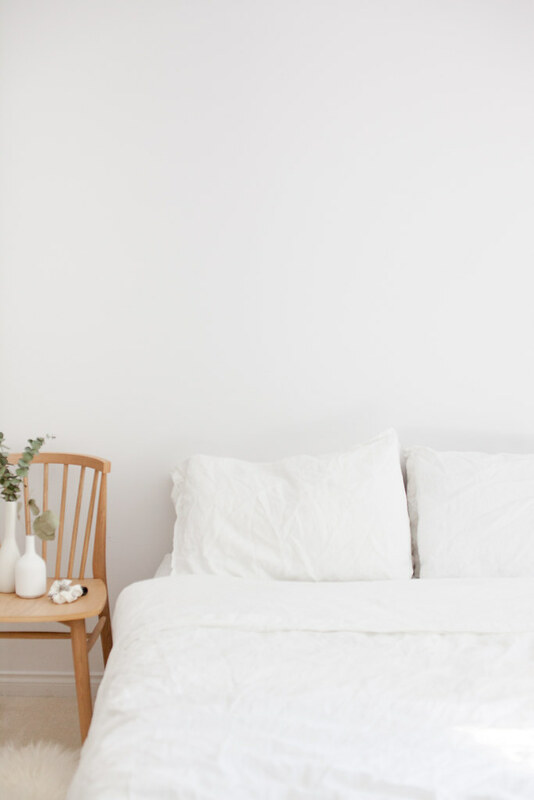 As mentioned, my sheets are from Flax Sleep, which is not only priced better than any other French linen bedding I’ve found, but it’s run by a team of three amazing women based in Vancouver. It’s a priority for me to grow in supporting local, women owned businesses so this is a huge plus for me! The brand also offers a 60 day sleep guarantee, and any returned sheets are donated to a local charity that supports safe housing for women and children. Win-win! I think it’s safe to say that I’m now on the linen bandwagon – I’m looking forward to adding some pieces of clothing in this material to my wardrobe this summer! I picked the Flax Set in Cloud, but if you’re a pastel lover there are a few other beautiful shades to choose from. 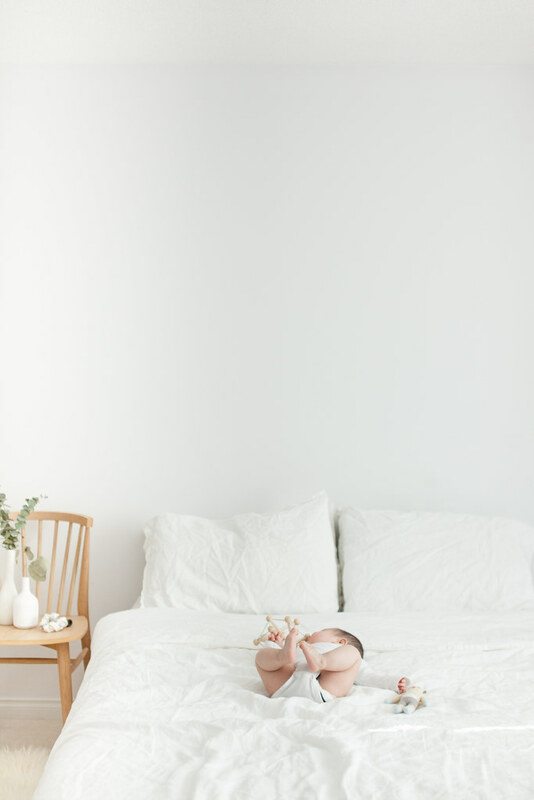 They also do separates if you want to mix and match multiple colours, and have lovely baby sheets (on the wishlist for Miles) and robes (we just purchased one for our sister-in-law for her birthday). Let me know if you have any questions! This post was created in collaboration with Flax Sleep, but opinions are my own.